Swansea City are set to hand 17-year-old goalkeeper David Cornell a place on the bench for Saturday's home FA Cup fifth-round match against Fulham. 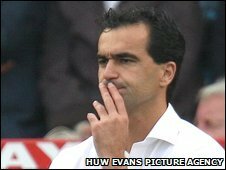 Boss Roberto Martinez believes Cornell is good enough to compete with Dorus De Vries for a place in the first team. "I'm delighted with David, I think he's surprised everyone," Martinez said. "He's only a young man but he's developed very quickly and that's the sort of situation that I want to find the answers within our youth [team]." Most recently Swansea had Dimitrios Konstantopoulos, on loan from Coventry City, as the back-up to De Vries. But the Liberty Stadium outfit failed in their attempt to sign the Greek before the close of the January transfer window, who instead went on loan to arch-rivals Cardiff City until the end of the season. How will Swansea fare against Fulham? The swift progress of Swansea-born youngster Cornell has persuaded Martinez to promote from within. Cornell toured Spain with the Swansea senior squad in pre-season only to suffer a serious wrist injury, but the youngster has bounced back strongly. "David is now going to push for a position in the first team and present stiff competition for Dorus De Vries," added Martinez, who said he is not looking for a loan goalkeeper at the moment. Swansea, who knocked out FA Cup holders Portsmouth in the last round, have Angel Rangel available for Saturday's clash with Fulham after suspension. The right-back was ruled out of last Saturday's Championship game against Ipswich after picking up five bookings this season.